National University of Singapore (NUS) researchers have found out that conversion of mangrove forests for other uses such as rice cultivation and palm oil farming is posing a threat to their existence in Southeast Asia. In a press release, the NUS said that two per cent or more than 100,000 hectares of mangroves in the region have been lost from 2000 to 2012. According to the statement, mangrove forests play an “important role” in mitigating carbon dioxide emissions and are important ecosystems globally. “This is the first study to systematically quantify the conversion of mangroves to different land use types in Southeast Asia and identify the key drivers of mangrove deforestation over the last decade. While the available data potentially show encouraging signs of a slowdown in mangrove deforestation, it is important to note that mangrove loss in Southeast Asia still remains substantial,” Assistant Professor Daniel Friess from the department of geography at NUS said. The study says that Southeast Asia has the greatest diversity of mangrove species in the world. This type of ecosystem facilitates higher densities of carbon storage as compared to other ecosystems. Mangroves have a host of benefits. These forests are a source of livelihood to millions of people. Mangroves also increase fisheries by providing habitat for young fish and offer coastal protection against storms, floods and a rising sea level. “Mangroves are one of the best ecosystems globally to store carbon in their vegetation and water-logged soils. Thus, they may store three or four times more carbon than an equivalent area of terrestrial forest,” Friess added. In an interview given to Down To Earth, environmental economist Jonah Busch had said that the biggest driver of tropical deforestation “is industrial agriculture—palm oil, beef, and soy, in addition to wood”. Echoing similar sentiments, Friess added that mangroves provide us with a shoreline that can adapt to sea level rise up to certain rates. “They do this by trapping sediments or creating soil through the decomposition of root biomass etc. So, mangroves may be able to provide coastal communities with a long-term, flexible and adaptable form of coastal defence under certain conditions. National mangrove protection policies would be very beneficial for their conservation because in many countries mangroves fall through the gap between terrestrial laws and marine laws,” he said. The worrying trend is that mangroves in Southeast Asia have witnessed extensive deforestation over a considerable period of time. Growing global demand for commodities as a result of population pressure and increasing affluence are responsible for the sorry state of affairs. Friess and Daniel Richards from the department of animal and plant sciences at the University of Sheffield have examined the factors leading to mangrove deforestation in Southeast Asia. They found out that the rapid expansion of rice agriculture in Myanmar and conversion of mangroves for oil palm plantations in Malaysia and Indonesia are threatening the mangrove ecosystems. Both the researchers have termed it as “under-recognised threats”. In Myanmar, rice cultivation has accounted for more than a fifth of the total mangrove change in the region, the release said. The study acknowledges that development of oil palm plantations is already a “major driver” of terrestrial forest and peat swamp deforestation in Malaysia and Indonesia. 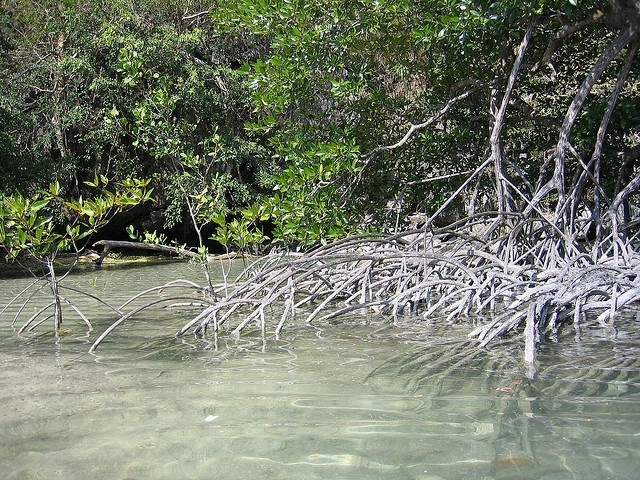 “Our study provides detailed information for evidence-based conservation of mangrove forests. Future research and policy interventions, at the national and subnational level, must consider the diversity of drivers of mangrove deforestation,” said Richards. According to the study, rice production is considered critical in Myanmar for national food security while palm oil production in Indonesia, Malaysia, and Thailand is promoted to enhance the economy and improve national energy security. While the study did not cover the Sundarbans, Friess said that other researchers have used a similar method to show that the region was relatively stable between 2000 and 2012. “However, while there hasn’t been large-scale conversion, the quality of the mangrove may be still threatened by logging, pollution, oil spills and sea-level rise,” he told Down to Earth. In a press release a few years back, the Food and Agriculture Organization (FAO) had called for better mangrove protection and management programmes. The world has lost around 3.6 million hectares of mangroves since 1980, equivalent to an alarming 20 per cent loss of total mangrove area according to FAO’s mangrove assessment study entitled The world’s mangroves 1980-2005. According to the FAO, Asia suffered the largest net loss of mangroves since 1980, with more than 1.9 million hectares destroyed, mainly due to changes in land use. North and Central America and Africa also contributed significantly to the decrease in mangrove area, with losses of about 690,000 and 510,000 hectares respectively over the last 25 years. At the country level, Indonesia, Mexico, Pakistan, Papua New Guinea and Panama recorded the largest losses of mangroves during the 1980s.